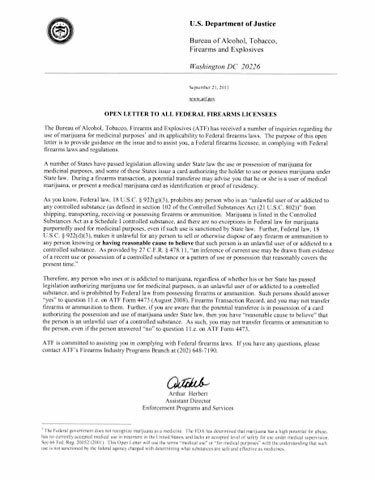 ATF letter sent to gun dealers. According to Arthur Herbert (see memo at right), Assistant Director of Enforcement Programs and Services at the ATF, “any person who uses or is addicted to marijuana, regardless of whether his or her State has passed legislation authorizing marijuana use of medicinal purposes, is an unlawful user or addicted to a controlled substance, and is prohibited by Federal law from possessing firearms or ammunition” and will be compelled to admit the prescribed use of medical marijuana on ATF forms at the point of purchase. The ATF’s intimidating letter appears to be a direct response to an effort earlier this year by police in Oregon to deny concealed weapons permits to medical marijuana patients. In April, the Washington County Sheriff’s office argued that the 1968 U.S. Gun Control Act prohibits selling firearms to drug addicts and claim that includes medical marijuana card holders. More significantly, the ATF’s move to deny cancer and other patients medical marijuana is part of a larger attempt to roll back the Second Amendment by color of law and also attack states’ rights as guaranteed by the Tenth Amendment. In the recent past, the federal government has attempted to deny military veterans their Second Amendment right to own and possess firearms. In 2009, Democrat and notorious gun-grabber Rep. Carolyn McCarthy introduced The No Fly, No Buy Act (H.R. 2401), a bill that would have merged the TSA’s no-fly list with the National Instant Criminal Background Check System (NICS), a point-of-sale system for determining eligibility to purchase a firearm. The current mayor of Chicago – the largest anti-Second Amendment city in the country after New York City – and former Obama Chief of Staff Rahm Emanuel proposed that anybody on the fed’s no-fly list (numbering in the tens of thousands) should have their Second Amendment stripped. The feds are determined to whittle away at the Second Amendment and this under-handed effort to make gun dealers responsible for determining if their customers are marijuana “addicts” – under penalty of loosing their licenses – is part of the long term plan to disarm the American people.